PIN-less - Easy to use. 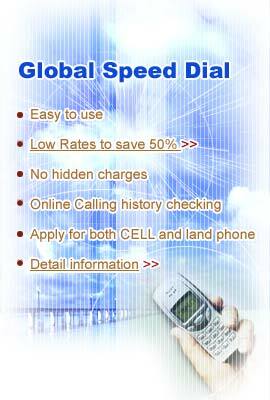 One Speed Dial connects to over 250 countries in the world. Rechargeable - Convenient to use. No expiration date. International Call Back - allows you to make calls FROM & TO any country in the world. Saving Money - Cutting your phone bill with extraordinary rates!! Clean Minutes - No connection fee. No monthly fees. No hidden surcharges. Crystal Quality - with Great low rates. Online Account - Online billing and calling history checking.